When you think of what might be in a chemistry laboratory, do you think of Cheetohs, dish liquid and Styrofoam? Those were three of the items that edutainers from OH WOW! 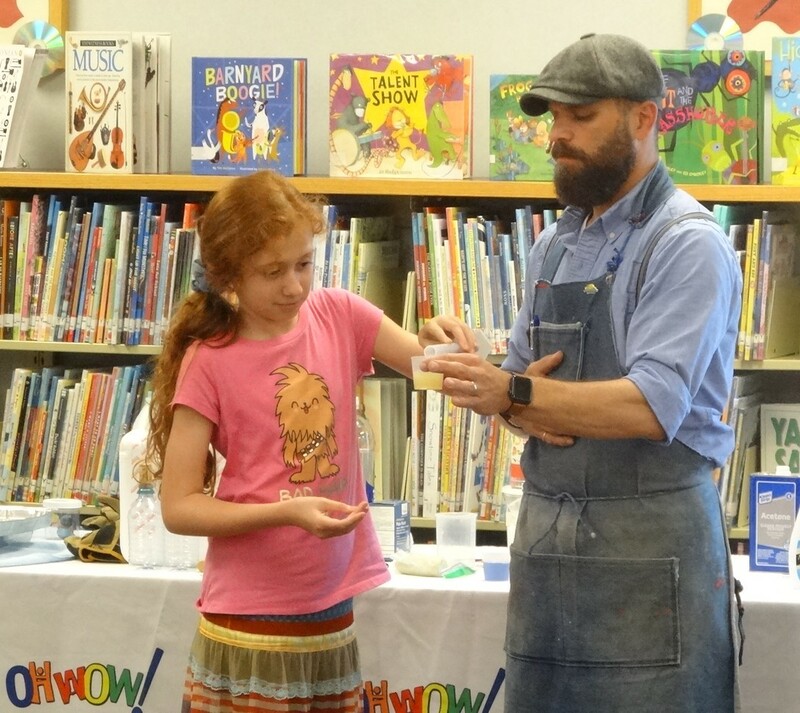 The Roger and Gloria Jones Children’s Center for Science in Youngstown brought with them June 13 for a program on “Cool Chemistry” at the Brookfield Branch of the Warren-Trumbull County Public Library. 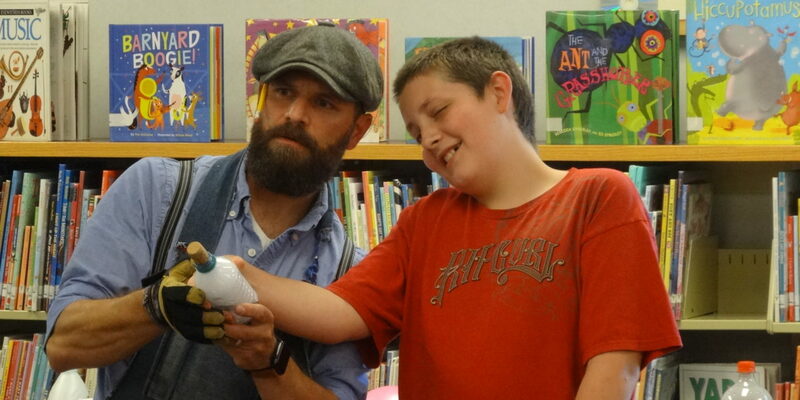 It all goes to show that kids can be made aware of science through fun, said Senior Edutainer Ralph Urbach. “We like to play all day but teach you things,” he said. Meredith Wall pours cabbage juice into bleach to test whether the bleach is an acid, a base or a neutral. It’s a neutral. Ten-year-old Meredith Wall called the exhibition “amazing,” and said she enjoyed how Urbach used cabbage juice to test whether different liquids – including bleach, dish liquid and water – are acids, bases or neutrals. The Styrofoam was used to teach the concept of assimilation. While Styrofoam is great for packing material, it’s not great for the environment because it’s not biodegradable; it doesn’t break down when exposed to water, air or soil. But, Styrofoam will dissolve when placed in acetone, the stuff that’s also in nail polish remover. 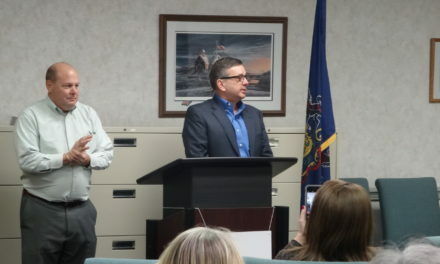 Urbach placed about an eight-inch-long piece of Styrofoam in a small measuring cup filled with acetone, and the Styrofoam got shorter and shorter until it dissolved. Ralph Urbach feels the steam coming off a pile of bubbles made by mixing peroxide, potassium iodide, green food color and dish liquid. Urbach and Edutainer Aislinn Janek blew up a balloon by placing it over a bottle that contained baking soda and vinegar (which creates carbon dioxide); and blew a cork across the room by placing it in a bottle that contained dry ice (solid carbon dioxide) to explain sublimation, the process in which a solid turns into a gas. Dish liquid is a great additive simply because it makes bubbles. 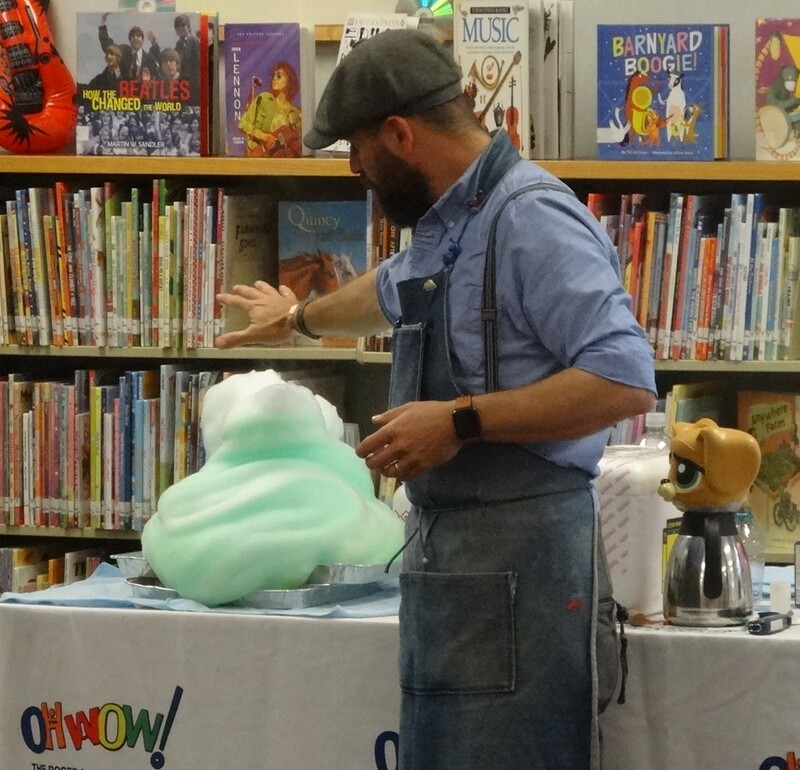 Urbach added it to a mixture of peroxide, green food color and potassium iodide to show the exothermic reaction that occurs when peroxide and potassium iodide collide. An exothermic reaction produces heat and energy, and the mixture bubbled up in a green mass about a foot high. Urbach popped Cheetohs into the liquid nitrogen, instantly freezing them, fished them out with a cooking utensil and had the kids eat the Cheetohs. If they kept their mouths shut as they chewed, streams of white jetted from their noses. In top photo: Ralph Urbach helps Gage Ball aim where the cork will go when the carbon dioxide inside the bottle expands to the point of ejecting the cork. 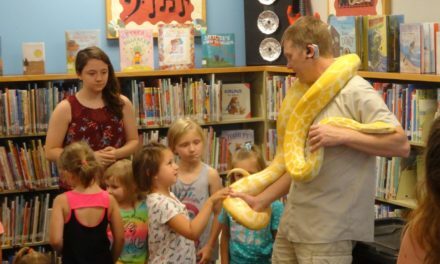 Get Wild for kids in grades kindergarten through six to learn about gardening, science, art and food, 3 p.m. June 20 and 25. Dress to get dirty. Registration required. Preschool STEAM Club for ages 3 to 5, 1 p.m. June 20. Read to Some Bunny for ages 5 to 12, a reading therapy program, 6 to 7:30 p.m. June 27. Registration required. Outback Ray’s Amazing Animal Show, 3:30 p.m. July 12. Stories Rock! a puppet show, 1 p.m. July 17. 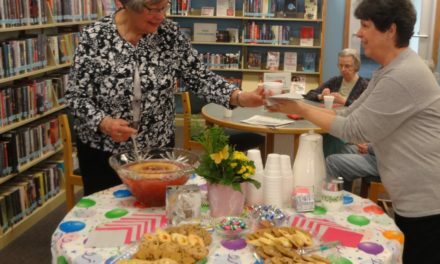 Summer Reading Challenge Finale Party, 1 p.m. July 24. Registration required.